CSS galleries are beautiful resources for getting inspired & promoting the websites we created. MeeCSS is a free web-based application which eases this process. It is not an automated submission system which would not be ethical. It simply asks you to fill the information that will be required (name, e-mail, website address, etc.) & with the help of an iframe, you can submit to the galleries one-by-one by copy-pasting the fields you had filled. In spite of the tremendous expansion of the Internet, the power of the printed word remains strong and popular. Print media is where it all began and today we take a close look at some amazing design magazines that can really boost your productivity and expand your design knowledge. In addition to their printed versions, some magazines also offer online versions on their websites as well as PDF downloads and single issue orders. Order online or pick them up at your local bookstore. 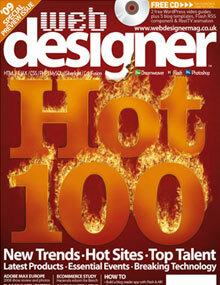 Web Designer is the UK’s premier publication for the discerning online author. Aimed at all those at intermediate to professional levels within the trendy 20-35 age bracket, its predominantly tutorial-based format follows cutting-edge projects in Dreamweaver, Flash, and Photoshop. Supplemented by the latest industry news and feature topics, Web Designer reflects all that is inspirational and exciting about working with new media content – representing the only choice of its kind on the newsstand. As print mags are getting cut from publishers lists, web-based magazines are springing up to replace them. Here are a couple of recent launches. Click Creative is a free, bimonthly magazine available online in PDF format. It’s focus appears to be 2D and 3D design, photography, web and interactive media. The Nov 2008 issue is 11 pages [2.39 Mb PDF file]. The next issue is out on Dec 6/08. They’re currently looking for new cover art. Information at their website.